987 customers found this review helpful. Did you? Yes, I did! Completes the set I bought the 20cm copper lid to complete the purchase of my 20cm copper casserole. It's difficult to say anything particularly helpful about a pan lid but I would say that the fact that the lids keep food warm in the pans after I have finished cooking makes them an essential piece of kit. I use the copper casserole to boil water & the lid obviously helps bring it up to temperature faster. Great Lid Compliments 20cm Frying Pan perfectly. 930 customers found this review helpful. Did you? Yes, I did! Finding out how it can be used I wanted to have lids for our pots mainly to avoid moisture loss and speeding up the heating. I have noticed the lid does not completely "seal" the pot which in a sense is good to let the expanding vapours to escape the pot. The straight handle is not very ergonomic and would benefit, in my opinion, of a slight curvature. The positive is being cast iron can go directly inside the oven. 921 customers found this review helpful. Did you? Yes, I did! 909 customers found this review helpful. Did you? Yes, I did! Worth considering Having previously purchased Falk sauté and sauce pans, i was of the opinion that a copper lid was superfluous, and instead opted to buy some cheap lid with equivalent dimensions. However, having bought a couple of cheap non-copper lids i found that neither fit properly. Perhaps for a sauté pan that is not a major issue, but when i purchased the casserole dish, i wanted a lid that was going to sit properly on the pan, so i bought the matching Falk lid. I'm glad i did because the lid fits the pan wonderfully, and it's got some reassuring weight to it. Perfect Lid The lid is every bit as good as the pan: well-constructed, elegant and heavy. Superior Quality Product & Excellent Customer Service! I didn't have to research copper cookwear online for very long before I saw the common theme of people raving about Falk Culinair. I bought this item as part of the Starter Set, a great combination of products that helped us to start our collection! The quality is perfect, which can be felt by the weight and sturdiness of the item alone. The perfect finish of each product, superior cooking (due to even heat transfer) combined with excellent customer service and super fast delivery made for a very pleasant purchase overall. I'm looking forward to using these pans for many years to come and would 100% recommend Falk Culinair's product to anyone in the market for top notch copper cookware. 827 customers found this review helpful. Did you? Yes, I did! Love the design Very Beaty handle, love the design! 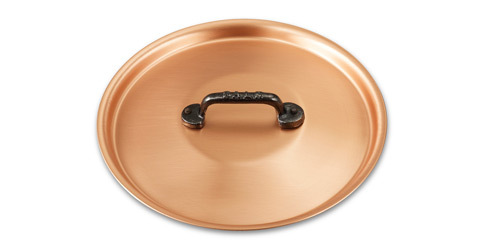 You can combination this lid with 20 cm copper rondeue and copper soucepan. 786 customers found this review helpful. Did you? Yes, I did! A great accessory Bought to accompany the saucepan, very useful and I'm glad I decided to go the extra mile. Great lid I got both the 18cm and 20cm lids, both are identically good in terms of quality, and both fit their intended pans like a glove. I do suggest pushing the lid toward the handle of the pan if your handle is cast iron, so that steam can escape on the opposite side and not risk causing rust on the handle. 782 customers found this review helpful. Did you? Yes, I did! 774 customers found this review helpful. Did you? Yes, I did! 771 customers found this review helpful. Did you? Yes, I did! Go on ... you know you want to ;O) Great seal means that you can get (and keep) things at the right temperature with very little wastage of energy. If you're going to spend all that on the pan you might as well do it properly!